Francis Hewson Barton was born in June 1880 at Farndreg, Dundalk, Ireland and educated at Haileybury College. Having served with the Bedfordshire Regiment in South Africa and earned a 'mention' (London Gazette 10 September 1901, refers), he transferred to the Royal Irish Rifles in October 1901 and thence to the Indian Army in 1903. Promoted Lieutenant in January 1904 and Captain in February 1909, he was serving with the 2nd Battalion, 2nd (King Edward's Own) Gurkha Rifles at the outbreak of the Great War. Barton was killed in action on 2 November 1914 at Rouge Croix and is buried in the Royal Irish Rifles Cemetery, Laventie, France. He is also commemorated upon a memorial, together with his brother, at the St. Nicholas Parish Church, Dundalk. 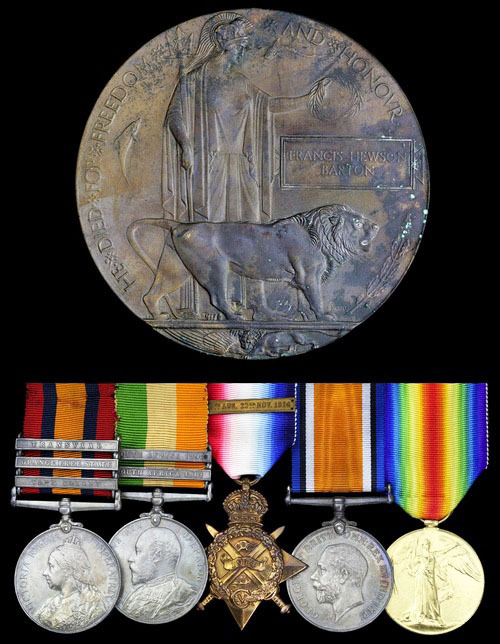 His Medals were issued by the India Office to his mother in November 1921. There was a lot in interest in the group to Captain Barton and it sold for a hammer price of £2,000. I always wonder when you encounter a price realised on the hammer like that, if they have gone to a family member, either way, the price cannot be compared with the awful price Captain Barton had to pay.